As a thank you to all of you readers that make writing delight by design so much fun and incredibly rewarding, I thought it was high time for a giveaway! If you have read for a while you will know that I love the creations of Kage Handbag's and am excited to be giving away one of her canvas farmer markets totes. I know I would love taking it more than just to the grocery store! All you have to do is comment on this post (make sure to leave your e-mail address) before 5 PM EST on Friday! Simple, right? Will be announcing the winner (at random) on Sunday, May 2nd! Also make sure to check out some of her other lovely bags and accessories. Love Kage, went to high school with Kristen. Her pieces are beautiful. Love those two colors as well as the pattern... Great giveaway! Love it! ashleyg_brown at yahoo dot com. I have had my eye on Kage handbags for quite some time - great giveaway! Oh! I'd love to win this. What a great giveaway! I love Kage's bags! Cary dot Telander at gmail dot com. love this line...i would carry this tote everywhere!! great giveaway, Blair! I'll have to go check out the store. Super cute bag! I am really enjoying your blog, thanks! This bag could definately do multi duty. Diapers? Sketch book? Book bag? Farmers Market? Hmmm. yeah for give aways... love the bag and your blog! 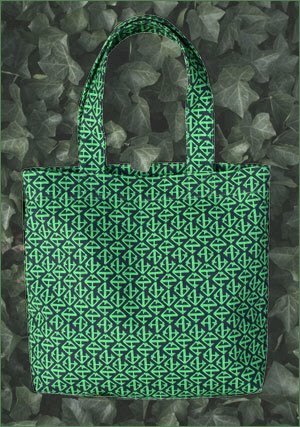 I am loving green right now, and a girl can never have enough cute tote bags!! Great bag! love it. really enjoying reading your blog. The colors of that bag are so fresh! This would be perfect for those quick runs to the market! Beautiful! I must admit to having a slight addiction to cute tote bags. As a teacher I use them to drag books and papers to and from school daily! This would be perfect! This bag is awesome. Did you catch the Wilson bag on the site? Wow. Show stopper. But I would be blissfully happy with this bag. Oh, Giveaway, how I love thee. Count me in - the bag is gorgeous! Just right. Not too earthy, not too bold. Love the green!! Such a great color for spring! just discovered your blog. happy to run into a great giveaway. fingers crossed! thanks. count me in!! super cute!! hop[e you are having a fabulous day!! Love this bag! I live in DC where there is now a tax on plastic bags so carrying reusable totes is a must! What a beautiful bag! Market totes are becoming my new obsession. I wish everyone the best of luck with the giveaway. Cool bag; cooler blog. Thanks! Love it! I heart tote bags! Cute! Perfect to take to the market! A lovely way to go green! My friend! I've missed you! I'm sorry I've been a terrible blogger, but what a way to revisit a friendly blog...here's to winning! Nice hand bag . It's color is also nice .